"Light coloured wood painted black." One piece solid timber, painted or stained. Note: There are five holes on the right hand rail, probably used to secure the board in some type of display, before it was removed and passed on to Alfred Fowler in 1890, image right. None, standard for the period. 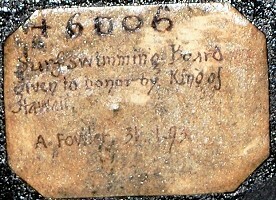 Surf swimming board given in honour by King of Hawaii. 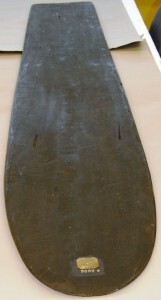 Surf board, a long black wooden board with a rounded leading edge, tapering slightly along length to a straight-edged end. Nearly consistent depth across board. Regular, rectangular holes cut in along the two long sides, ranging from 0.5 to 1cm from the edge. One hole rounded, as if to fit a screw. 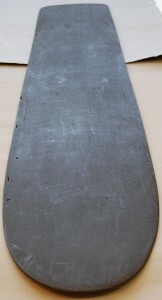 Surf swimming board, consisting of a plank 5’ 11” long the edges nearly parallel, the width ranging from nearly 11” to 13” one end square the other rounded. Light coloured wood painted black. Especially vulnerable along long sides where the holes have weakened the edge, some splitting and breaking of the wood next to holes. Treatment details: Cleaned with Wishab sponge (vulcanized latex,filler). The catalogue gives two descriptions, the first a recent one (in metric), and reproduces an earlier description circa 1893, in imperial dimensions. Only the early description notes the wood is painted and the concavo-convex (sic) faces. The later description notes the "regular, rectangular holes cut in along the two long sides, ranging from 0.5 to 1cm from the edge" and one "rounded, as if to fit a screw." These are five holes on the right hand rail, probably used to secure the board with rope, hooks, or screws, in some type of wall display, before it was removed and passed on to Alfred Fowler in 1890. Contrary to common practice, the photographs of the board are shot from the nose, with the template seriously compromised by the perspective. An attempt has been made to adjust this in the image at the top of this entry. The conservation treatment, essentially a delicate clean, in December 2004 was possibly in preparation for loan to the Museum of British Surfing, but I can find no record of such an exhibition. This surfboard, +6006, was donated to the British Museum, London, in 1893 by Alfred Fowler, who was personally presented with the board by the King of the Sandwich Isles, Kalakaua. Alfred Fowler, of Leeds, arrived in Honolulu in March 1890 as a representative of John Fowler & Co, the family engineering and steam locomotive business, and was instantly embraced by the Royal court and the cream of local society. While in the islands he travelled extensively, often in the company of Col .Macfarlane, effectively the English ambassdor to the Hawaiian court, and, occasionally, with the King himself. Flower also had time to court Miss Eva Neumann, the daughter of a prominant Honolulu family; their engaement announced on 1st July and the ceremony, "one of the most brilliant weddings that has taken place in Honolulu," was conducted at St Andrews Cathedral on 19th November. The couple were later honoured with a royal breakfast at the Iolani Palace where "their Majesties presented Mrs Fowler with a handsome mamo lei (a rare royal feather necklace) enclosed in a carved sandal wood case as a wedding present." 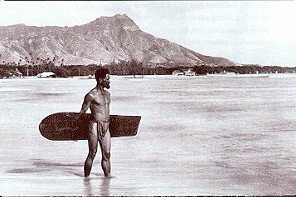 Before departing for England in late December 1890, Albert Fowler was also presented with a "surf swimming board," undoubtedly, like the mamo lei, from the royal collection. On his return to England, Fowler donated a number of Polynesian artifacts to the British Museum collection, including the surfboard on 31st January 1893, where it was given the catalogue number +6006. King Kalakaua was known to be an enthusiastic supporter of tradtional Hawai'ian culture, particularly demonstrated at his Waikiki luaus, that often featured exhibitions of surfboard riding, in the late 1880s. One account by an English guest in 1887 reported that the King "personally took us to his seaside (residence) and there gave us its freedom and from its windows pointed out to us the native skill at surfriding." An American military officer wrote a similar account and provided illustrations of surfboards of similar dimensions to +6006. The board given to Fowler, however, was surely a board of considerable antiquity. Certainly its poor condition upon acquisition suggests it was unlikely to be in regular use, and the five holes on the right hand rail indicate that it had probably been previously mounted as a display. Tthe inital BM cataloguer described the board as "light coloured wood," possibly suggesting the timber is not koa, and "painted black," which may be a traditional preservative. Measuring 5ft 11 in x 13in, the board was probably ridden prone, however, it is at the extreme minimum for riding kneeling or standing. In December 2004, the board was cleaned in preparation for loan, possibly for the Museum of British Surfing, but I can find no record of such an exhibition. The board has recently been added to the British Museum's online catalogue. Note that, contrary to common practice, the photographs of the board are shot from the nose, and the curvature of the template is significantly exaggerated by the perspective. King Kalakaua's Surfriding Luaus, 1887. "Personally he took us to his seaside (residence) and there gave us its freedom and from its windows pointed out to us the native skill at surfriding." - Bath Independent, England, August 27, 1887, page 1. The illustrations below accompanyied a similar account by American military officer, with boards of similar dimensions to #6006. -The Sun, New York, August 28, 1887, page 9. At these dimensions, 5ft 11 in x 13in, this board is at the absolute minimum required to ride kneeling, if not standing. In 1890, the board was illustrated by James Edge-Partington in his An Album of the Weapons, Tools, Ornaments, Articles of Dress of the Natives of the Pacific Islands, J. Edge-Partington &​ Charles Heape, Manchester, 1890. Lithographed by J.C. Norbury, the album comprised drawings from examples in public & private collections in England. 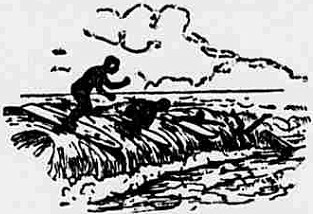 In 1899, the illustration was reproduced by Stewart Culin in an article, Hawaiian Games, in the American Anthropologist, Volume 1, Number 2, New York, April 1899, page 213. Mr. Alfred Fowler, of London, will visit the now Kauai sugar estate this week, sailing on the Mikulinhi this afternoon, in company with Col.
Mr. Fowler was presented to His Majesty at the Palace last week, and paid his respects to the British Commissioner, besides calling on the leading merchants here, with whom his firm have had large transactions in tiie past few years. The firm's make of railways and steam ploughs arc known all over the Islands. Mr. Fowler will leave for the Volcano next week, and also visit the Palinhi estate at Kau, in which his firm is interested. He will leave the latter part of next month, for Japan and China, on his journey round the world. Mr. Alfred Fowler of the firm of John Fowler & Co., England, arrived on the Australia, and is the guest of Col. G. W. Macfarlane, H. M.'s Chamberlain. His Majesty arrived at Kailna early Saturday morning week on the steamer V. Gr. Hall. Mr. Alfred Fowler, Col. (J. "VT. Macfarlane and Mr. Allan Herbert also landed there. The Gilling party, who were on the same steamer, on their way to the Volcano, were invited by His Majesty to remain two days at Kailna. H. B. M. S. Champion arrived at Kailaa. Sunday morning, and carried the Gillig party and they went from there to the Volcano House. The King embarked on the Champion at Kailna on Tuesday and was taken around to Hilo, where he remained until Monday, when the Champion will bring him to Honolulu, arriving Tuesday morning. Capt. St. Clair, after mooring his vessel safely at Hilo, was to proceed to the Volcano. Mr. Alfred Fowler accompanied the Gillig party to the Volcano, he having with Col. Macfarlane made an inspection of the districts of Kailna and Kona. Mr. Herbert and Col .Macfarlane, the latter who had private land matters to attend to for His Majesty remained over to make a further inspection of the districts, and returned nday on the V. Or. Hall. Tuesday evening Their Majesties the King and Queen gave the first of a series of musicales at Iolani Palace. It was held in the blue room which was most tastily decorated with potted ferns and palms, and flowers. Their Majesties were most affable to all. One interesting feature was the display of the feather cloaks in the Throne room. The whole interior of the Palace was brilliantly illuminated with the electric light. By the ship Borrowdale, which arrived this morning, three of Messrs. John Fowler & Co.'s steam ploughs, were received by O. W. Macfalane & Co.
One for H. P. Baldwin's estate, one for Col. Spalding, and one for R. Halslead. Besides these ploughs a huge lot of rails came to hand, as well as sugar machinery from Messrs. Mirrlees, Watson & Co.
Mr. Alfred Fowler arrived by the Likelike from Maui yesterday. His Majesty the King enteitained at breakfast yesterday morning at the palace, Mr. Alfred Fowler, of London, prior to his departure for Japan. Hon. John O. Domini-,, Hon. A. S. Clegiiorn, Capl. A. St. Clair, U. N., Mr. F. A. Sclinefer, Mr. J. II. J'aty, lions. I Neumann, G. Irwin, H. I. Hahlwin, W. H. Cornwell, Sand, l'arker, Mr. F. Spencer, and Mr. Herbert. The Chamberlain, Col. G. W. Macfarlane, and Mr. J. W. Robertson, Vice-Chamberlain, were present at the breakfast. Last Saturday evening the Hons. Sam. Parker and W. H. Cornwell gave a dinner at the Hawaiian Hotel in honor of Mr. Alfred Fowler of England who leaves to-day for Japan. Those who sat down at table were: His Majesty the King, Mr. Alfred Fowler, Capt. St. Claire of H. B. M. S. Champion, Hons. Paul Neumann, John O. Dominis, EC. Macfarlane, Wm. G-. Irwin, S.Parker and W. H. Cornwell, Col. G. W. Macfarlane and Mr. Allen Herbert. The Hawaiian string band occupied a position on the versed near the dining room and gave voeal and instrumental selections during the dinner, which was a very pleasant affair. Mr. Alfred Fowler accompanies Mr. R. A. Macfie, Jr., this evening, to Kauai, to visit the Macfie Sugar Estate at Kilauea, and see the great results of steam ploughing on this plantation. It is said the output of this estate this year will reach 3500 tons, while a few years ago, the average crops were about 1000 tons. Mr. Alfred Fowler decided last week not so leave on the Yamashiro Maru, as two steamers leave next month for Yokohama and he was desirous of visiting Hilo and Hamakua. King Kalakaua Entertains Regally at Iolani Palace. The engagement has been announced of Miss Eva Neumann, eldest daughter of Hon. Paul to Mr. Alfred Fowler of London, junior member of the firm of John Fowler & Co., of Leeds and London. At St Andrews Cathedral, Honolulu, Nov 19 by the Rev Alex Mackintosh. Alfred Fowler Esq of London England to Eva, eldest daughter of Hon Paul and Mrs Neumann. One of the most brilliant weddings that has taken place in Honolulu was that at St Andrews Cathedral Wednesday evening when Mr Alfred Fowler and Miss Eva Neumann were united in the holy bonds of matrimony. Miss Eva Neumann is the eldest daughter of the Hon Paul and Mrs Neumann and has been a bright ornament in Honolulu society circles from which she will be much missed. Handsome, highly accomplished, having travelled extensively and charmingly gracious in manner she has endeared herself to hundreds of friends. Mr Fowler, the bridegroom, is the junior member of the well known firm of Messrs John Fowler Co of Leeds and London, England, and a gentleman of cultured taste one who makes friends wherever he goes. He is a most excellent business man. The invitations announced the ceremony for 8:15 oclock but long before that hour the cathedral was crowded in every part and many hundreds of persons were simply unable to obtain admission. Even the windows were filled with people anxious to get a glimpse of the bridal party. There was no attempt at decorations, only two handsome bouquets of choice white flowers which stood on the altar. The ushers were Mr Oscar Herold, Mr J M Monsarrat, Ensign Blow and Cadet Gartley of the flagship Charleston. At 8:05 the organ struck up with a Wedding Hymn by Randegger, followed by a Wedding March by Warneford, Mr Wray Taylor presiding at the instrument. During this time the groomsmen took their places at the head of the nave. At 8.20 o'clock the arrival of the bride was announced by the strains of the Lohengrin Bridal March. Leaning on the arm of her father the bride advanced slowly up the aisle to the chancel steps where she was met by the bridegroom. Jones and Cadet Churchill of the Flagship Charleston, Messrs John S Walker Jr, Ernest H Wodehouse and Alika C Dowsett. The maid of honor was Miss Inez Neumann, sister of the bride, who looked very pretty in a costume of pale green trimmed with pink and lace. The bridesmaids were Miss Agnes Walker dressed in pale blue, Miss Rena Herbert in white, Miss McGrew in acrne, Miss Hattie Brown in rose, Miss Helen Wilder in lavender, and Miss Delia Widdifield in canary color. Mrs Neumann, mother of the bride, occupied a seat in the royal pew during the ceremony. the ceremony performing it in such a manner as to deeply impress the vast assemblage an undercurrent of melody issuing from the organ throughout. After the ceremony, the bridal party withdrew to the vestry to sign the register while the choir of ladies and gentlemen sang the hymn, "The Voice That Breathed O'er Eden." Between the hours of 9 and 11 o'clock, a reception was held at the residence of the brides parents, King street. The parlors were decorated with flowers flags and evergreens. A canopy of white tulle wreathed with choice flowers occupied one corner of the main parlor and suspended from it was an exceedingly handsome marriage bell of white chrysanthemums and yellow roses. Under this, the happy couple received congratulations which were eagerly offered by their large circle of friends and other specially invited guests. Panels of different colored flowers principally roses are to be seen in every direction lie the veranda, with its wns of nags and illuminated by any colored lanterns presented a very pretty scene. The grounds were also illuminated with lanterns and torches. The presents were very numerous and of the most costly nature. The wedding cake made by warm friends of the brides family was a very handsome one. Refreshments were served during the evening in abundance. After the reception dancing was indulged in to a late hour. Mr and Mrs Fowler will leave on the K M S Mariposa December 20th for the Colonies, thence to England by way of India. The Advertiser extends its congratulations and wishes them a joyful wedded life. Those present were Their Majesties the King and Queen, Hon Paul and Mrs Neumann, Mr and Mrs Alfred Fowler, Miss Inez Neumann, Miss Finckler, Hon G W Macfarlane, H M s Chamberlain, Mr T McKenzie Fowler, Mr J W Robertson, H Ms Vice Chamberlain, and Mrs Robertson. After the breakfast, their Majesties presented Mrs Fowler with a handsome mamo lei enclosed in a carved sandal wood case as a wedding present. This gift of a rare royal feather necklace is the greatest compliment that can be bestowed. Impromptu Ball In Honor of the King, Admiral Brown, and Mr. and Mrs. Fowler. and under the patronage of Their Majesties. The event was designed as a pleasant send-off to the King, Admiral Brown and officers of the Charleston, and Mr. and Mrs. Fowler. the TJ S Flagship Charleston and Mr and Mrs Alfred Fowler was quite a brilliant affair. The blue room and the grand hallway were very prettily decorated with a profusion of tropical flowers and evergreens. The brilliancy of the electric light which illuminated the interior of the building added much to the effectiveness of the scene. Their Majesties the King and Queen and H B H Princess Poomaikelani stood at the entrance to the throne room while those who were present paid their respects. This informal reception being over dancing at once commenced to the strains of the Hawaiian string orchestra stationed on the front veranda. Among those presentwere Admiral Brown the captains and officers of the men-of-war in port members of the diplomatic and consular corp and a large number of prominent society people. The programme contained twelve dances. Shortly before midnight supper was served in the dining hall. At intervals during the evening the Quintette club sang selections on the back veranda of the Palace. The whole affair was exceedingly pleasant. Mr. Alfred Fowler and Miss Eva Neumann. The Polynesians arrived in Hawaii circa 1000 B.C. with an unequalled maritime knowledge and skills to the finest surfing location on the planet. Not only was there consistant swell and a tropical climate, but a previously untapped store of timber. Willi Willi (Erythrina sandwicenis) - a light timber similar to balsa wood and used for outrigger floats. Koa. (Accacia koa) -a fine grained hardwood. Some reports suggest that Breadfruit or Wilii Willi were preferred timbers (particually for the longer Olo) for their lightness (and ease of shaping? ), however the only existing examples of these boards are in Koa wood. Probably the lightweight nature of these timbers was the cause of their disappearance. Some small (Paipo) examples exist in Breadfruit. A tree was selected and felled, sometimes with religous ceremony or offerings, and a board was roughly shaped by a stone adze on site. The board was then moved to a canoehouse or beach site where the shape was completed progressively with adze, various coral heads and an oahi rubbing stone. Usually several agents were mixed to produce a glossy black finish. 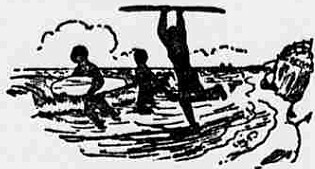 One account quoted by Tom Blake in Hawaiian Surfboard (1935, page 45) states that a willi willi board was immersed in mud to seal the timber grain. The finishing process was completed with the addition of kukui nut or coconut oil to assist waterproofing. These contruction processes were not exclusive to surfboards - they were standard practice in canoe building. Further coatings of oil were regularly applied as ongoing maintainence. After use boards were dried and stored, sometimes wrapped in cloth. Dimensions vary between 6 feet and 12 feet in length, average 18 inches in width, and between half an inch and an inch and a half thick. The nose is round and turned up, the tail square. The deck and the bottom are convex, tapering to thin rounded rails. This cross-section would maintain maximum strength along the centre of the board and the rounded bottom gave directional stability, a crucial factor as the boards did not have fins. Any discussion of the performance capabilities is largely speculation. 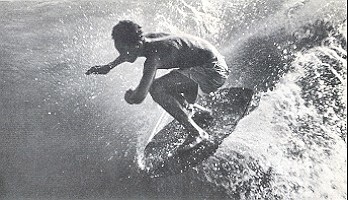 Contemporary accounts definitely confirm that Alaia were ridden prone, kneeling and standing; and that the riders cut diagonally across the wave. Details of wave size, wave shape, stance and/or manouvres are, as would be expected, overlooked by most non-surfing observers. Most early illustrations of surfing simply fail to represent any understanding of the mechanics of wave riding. Modern surfing experience would suggest that high performance surfing is limited more by skill than equipment. It is a distinct probablity that ancient surfers rode large hollow waves deep in the curl - certainly prone, and on occassions standing. Kuhio Pier, Waikiki, circa 1962. Above: #6006 to scape, template adjusted. Right: Perspective shots of deck and bottom. Geoff Cater (2004 - 2014) : #537 Alaia, 5ft 11'', c1850.